Have a look at our collection of hand-crafted items. If you would like something specific please contact us. Alpacas originate from the high plains in West-Central South America. This area of the Andes spans the borders of Peru, Chile and Bolivia. Alpacas are members of the camilid species and are closely related to the llama. There are four species of South American camilid – llamas and alpacas are domesticated and vicuna and guanaco remain wild and are protected species. Alpacas are generally hardy, healthy animals and are relatively easy to keep. However, it is important to be aware of acceptable ways of looking after this class of animal, including basic knowledge of their nutrition, exercise needs, breeding regimes, normal and abnormal behaviour. Owners need to check their alpacas at least once a day as they usually give little indication that they are unwell until they are very sick and need treated by a vet. Any change of behaviour can be a sign of ill health.They are social herd animals, therefore a single alpaca cannot be kept on its own. Many people start by keeping a small group of gelded males (wethers) or females. While llamas were bred to be big and strong, when it comes to alpacas it is all about the fleece. Coming in 22 different colours and all the shades in between, it is one of the softest, yet strongest fibres available and is also hypoallergenic and anti-bacterial. 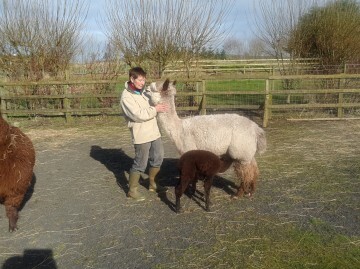 Huacaya fleece is fine, bright and fluffy giving the alpaca a soft cuddly teddy bear appearance. Suri fleece is fine, lustrous and hangs in silky wringlets.